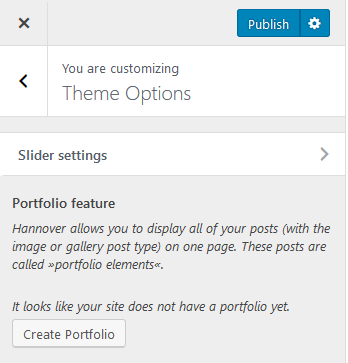 When you are opening a panel in the customizer, either you get options directly (like in the »Site Identity« panel) or links to sections (like in the menu area). By default, these links look like in the screenshot below for Slider settings – the section title in a light area background with an arrow on the right side. All base controls from the core can be created with the Customize JS API, except the dropdown pages control, that renders as a select list with all pages of the site. This means, we usually need to create that control via the PHP API at the moment.